If you’re familiar with our line, you know that we’re big proponents of using oils in your skin care routine. Since our skin naturally produces oils to protect itself, it is able to absorb and utilize oil more readily than an emulsified product (aka lotion). This means that using oils in your skin care routine allows for deep penetration of the qualities found in them. We infuse our facial oils with herbs and add essential oils for additional nutritive properties, but using a simple oil itself also provides the skin with significant benefits. Since everyone’s skin is unique to their own bodies, it’s important to use the right kind of oil for your skin. It’s entirely possible to over or under moisturize your skin, which can lead to breakouts, irritation, clogged pores, increased dryness, and/or dehydration. Because our facial oils are designed to work with specific skin types, each contains a specific blend of carrier oils. We wanted to take some time to explain the differences between these oils and what each of them does for your skin. Typically, carrier oils are called such by natural practitioners and in traditional healing roles — skin care professionals, herbalists, etc—and the reason is in the name. Carrier oils are often used to dilute essential oils and carry the healing properties to deep within the skin. High in antioxidants, this oil helps protect from environmental stressors. Grapeseed oil is also high in vitamin E.
Grapeseed oil is a popular ingredient in our skin care — you’ll find it in both Herbal Facial Oils, the Unscented Facial Oil, and both of our body moisturizers. It’s light enough to be absorbed by even the oiliest skin while still providing enough moisture for people that are working to balance their skin's look. If you’re working with very dry skin, grapeseed oil may not be the option for you, it’s very lightweight so it doesn’t provide the longer-lasting moisture that dry skin sufferers need. Jojoba oil is actually a wax ester that is similar in texture to the sebum that we produce naturally, making it ultra moisturizing and easily absorbed by the skin. Because of its waxy texture, jojoba acts as a long lasting moisturizer that can improve the look and feel of the skin immediately upon use. Because it’s so gentle and high in vitamins and minerals, it’s a great oil for those with sensitive skin. We use jojoba in our Anti-Aging Facial Oil, Anti-Aging Eye Cream, our Citrus Stem Cell Serum, and we always recommend it for people that are experiencing dry skin. At times, it can also be over-moisturizing and pore clogging for people that are working with oily or combination skin types, so it’s best for those who are not prone to oily skin. Like grapeseed, sunflower seed oil has high amounts of linoleic acid. It is also considered very safe for the most sensitive of skin. It’s a great moisturizer and it’s thin and absorbent enough for all skin types. We use sunflower seed oil in our Anti-Aging Facial Oil, Herbal Facial Oil for Normal and Combination Skin, both of our body moisturizers, and Sun Love. Coconut oil seemingly has an endless amount of uses and benefits for our bodies, and it’s no different with skin care. It's ultra-moisturizing and nutritious. We use it in a lot of our products, favoring fractionated for facial formulas and unfractionated coconut oil for body products. You can read about the differences here. Unfractionated coconut oil, like the oil in our Coconut Body Oil and our Coconut Honey Mask, is solid at room temperature. It’s very moisturizing, nutrient dense and high in vitamins like A, C, and E. Its large molecular size makes coconut a heavy oil that holds in moisture and can clog pores. Thus, this form of coconut oil can cause breakouts in people that are prone and we typically suggest they use fractionated instead. Got dry skin? Unfractionated may be right for you. Fractionated coconut oil is the same ingredient, but with the long-chain triglycerides removed, causing it to remain liquid at room temperature. It retains the antioxidants and vitamins but has a reduced molecular size, and is great for mature and dry skin. This form of coconut oil is still very moisturizing, but is a lot lighter and thus absorbs more readily into the skin. This is good news for those with oily skin. We use fractionated coconut oil in both of our Herbal Facial Oils and our Unscented Facial Oil. Avocado oil tops the charts in terms of fatty acid content. Avocado oil is moisturizing enough for dry skin and penetrates deeply so it doesn’t leave your skin feeling too oily. It may cause breakouts for people who are sensitive, but it can also be very helpful for unclogging pores. We use Avocado oil in our Sun Love and in our Anti-Aging Eye Cream. Hazelnut oil is another lightweight oil that provides good moisture. It’s packed full of vitamin E and antioxidants. Hazelnut oil is gentle, making it great for balancing oily skin that is also sensitive. The easy-to-absorb properties of hazelnut oil is why it’s in our Herbal Facial Oil for Oily Skin. Because of the nature of this oil, it isn’t the best carrier oil if you’re experiencing dry skin. People have been using olive oil on their skin for centuries with wonderful results. It’s a great moisturizer, not too heavy or too light, so it’s helpful for balancing without over-moisturizing. It is high in vitamins E, K, and A along with squalene so it’s very antioxidant rich. We use olive oil in our Coconut Body Oil and in our Herbal Facial Oil for Normal and Combination Skin because it’s so great for maintaining balance. Olive oil may be too moisturizing for people with oily skin and it may not be heavy enough for people working with very dry skin. So whether your skin is dry, oily, or somewhere in between, there's a facial oil out there that's right for you. It's all about knowing your oils and doing a little experimentation to find out which one really makes your skin glow. 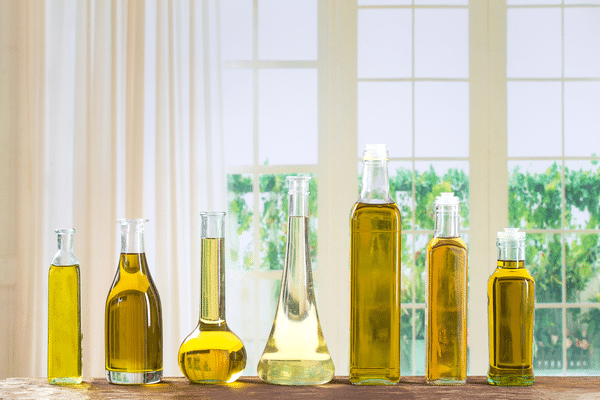 Which carrier oil works best for your skin type? Let us know in the comments below! can i mix hazelnut oil with coconut oil for my hair? Olive oil doesn’t belong on the face. I am highly allergic to coconut. Are there any products you have that do not have this ingredient. It is getting harder and harder to avoid as coconut oil is in EVERYTHING now! What about Argan oil? I’ve been reading so much about how wonderful it is for skin and hair. Hi! Do you have all the above information in the form of a chart? As I was reading through the info, I found it was a lot to process and realized I as trying to make a chart in my head! I’m currently using the Citrus Stem Cell Serum, but I’m not sure this is the optimal product,l for me, given the info above. So, if you don’t already have a chart, I may sit and chart these for myself — just to see what seems best!! I’m so appreciative of everything you all do!! We don’t have a chart, but there are charts out there if you do a google image search for carrier oils! I’m still a little confused. My skin has always been dry all over and yet I get fairly frequent breakouts. Which would be best for me? Dry skin can definitely contribute to clogged pores! You want to take care of the dryness when you’re working with that and usually the clogged pores will get better. For dry skin and clogged pores, the Citrus Mint Cleanser with the Unscented Facial Oil as a basic routine has been helpful. Using the Mud Mask as a spot treatment or mixing the Purifying Mud Mask with the Coconut Honey Mask feels awesome, feeds the skin, and helps to purify it! The article was greatly informative and I love your transparency regarding the ingredients in your products. However, I was confused/concerned with the fact that these plant-based oils are high in linoleic acid (an omega-6) and absorbed into the skin, yet they are anti-inflammatory. Some of the oils mentioned, like grapeseed oil, have a high omega6:3 ratio and therefore recommended to be avoided for consumption, yet based on your article are beneficial when applied topically. I thought it was best to reduce our omega 6:3 ratio because excess omega-6 in the body is inflammatory. Could you care to explain? Thanks so much! You’re right about the ratio of omega 6:3 being an important concern but it’s vital to have both in your body. The omega ratio is primarily through diet, so we do suggest working with a nutritionist to find what works for you. As for in your skin care, you’re using such a small amount of oil at a time that’s it’s very unlikely to create a shift in the balance that you’re working with. I bought three sample kits and I am shocked how small each sample is. I spent $30.00 and I feel ripped off. We appreciate your feedback! Please know that because we use such high quality, organic, and fresh ingredients, that the price of those ingredients are more costly, so we assure you that the size of our samples reflect our costs to create them. Our samples are meant to last just a couple of days, sometimes even up to a week. Please keep in mind that using a little bit of product goes a long way and the amount in your sample kit is enough for most people to start seeing results — even in that short period of time. Sunflower and coconut oil appear to be most promising for my skin. I used to get deep big pimples, and had lots of scaring. I gave up wheat and dairy, and haven’t had a blemish since! I took the skin quiz and it gave me a score but did not tell me what type of oil to use? This is confusing and not what I expected. I’m sorry about that Wren! I’ve been phasing out face lotion and replacing it with almond oil for about a year now. I have normal to dry skin and I find it works great! Moisturizes well in dry climates (Colorado and Northern California-drought season) and never clogs my pores! It’s very affordable at my local herb/oil shop; however, doesn’t give you that glow and wonderful fragrance that Anne Marie’s face oils give (: I wonder why almond oil isn’t mentioned…? !